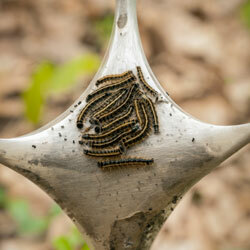 “Ugly” “disgusting” “gross” and “creepy” are just a few things gardeners say when they see tent caterpillars. Not only are they visually unattractive, but the hundreds of caterpillars within a tent can defoliate a shrub or tree in a matter of days. Fortunately, the attack is seldom fatal. The Eastern tent caterpillar, Malacosoma americanum, one of the 26 species of tent caterpillars or tent worms, emerges from its egg in early spring as the leaves of the host plant, generally a member of the Rosaceae family, begin to open. Along with other emerging caterpillars, it climbs up the plant and begins building a silken nest in branch forks to provide group protection from predators, maintain warmth and act as a staging site prior to leaving the tent. The worms quickly consume any leaves within the nest, forcing them to forage outside of the nest during the day. At night, they return to the protective nest to rest and stay warm. In fall, the individual caterpillars spin cocoons and two weeks later emerge as snout moths. As adults, they mate, lay eggs and die. Thus, the cycle starts again. Bacillus thuringiensis (Bt) effectively kills this pest when young. Following directions, directly spray onto surrounding leaves and onto the tent. The unsightly nest will remain, but the caterpillars will die. In time, the nest will decay and disappear, or it can be removed manually if desired. Releasing parasitic wasps and attracting birds to the landscape will also reduce the worm population. This provides a long-term solution and increases the natural biodiversity of the area. 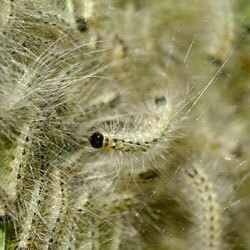 Wasps and birds will also help control many other unwanted insects in the region. Removing the tent removes the eyesore and the worms, if the tent isn’t too large. In the early morning or evening, when the worms have not yet left the tent or have already returned, thrust a stick into the middle of the web and twist until the tent is on the stake and off the tree, and then plunge it into soapy water to kill the worms. Or, remove it by pruning the branches and twigs going into and out of, the tent, but be sure to dispose of it properly so the caterpillars do not move on to another nearby location. In the fall, after deciduous leaves have fallen, remove any egg masses. Look for them on or near any trees previously infested. They’re usually 6-18″ from the tips of branches. Our friendly staff is here to answer your questions about these and other pests. We have a wide variety of safe and effective methods to keep your garden beautiful, and are always willing to help you find a solution that meets your needs and preferences.